A SLAM! #1 Review – Bring on the Bruises! Now feels like an appropriate time to be reading about women in strong, aggressive roles. That’s one of the reasons I picked up SLAM! #1. The other is that blaze of color on the right. That’s attitude, right there. This freshman issue introduces us to Jennifer Chu and Maisie Huff, two newcomers to the East Side Roller Girls who become fast friends. We see them learns the ins and outs of roller derby, and watch their anxiety over whether they’ll be drafted to a team. The end results pleasantly surprise them, but also threaten to dissolve their new friendship. Full disclosure: I know less than nothing about roller derby. I don’t know the rules, why they’re skating in a circle, or why they knock each other down. Pamela Ribon doesn’t go to great lengths to explain them, which turns out to be smart. Not everyone understands roller derby. But most people understand bonding with a new person over a shared experience. Ribon stays focused on the emotional and physical journey the characters are on, while at the same time drawing you into the derby world via the smaller details. Case in point: The page at left, which I love. The grease under the fierce eye, the wedgie, the bandages. Ribon and Veronica Fish pull you in with images you can understand and connect to. We also get pre-derby and after-derby shots of Jennifer and Maisie’s rooms, which instantly tells us how their lives and priorities have changed. Later on, we get my favorite image in the issue: Maisie flopping down on her bed smiling and content, but with two giant bruises from practice. Visual storytelling, ladies and gentlemen. This is how its done. I was pleasantly surprised at how real both Jennifer and Maisie seemed, in spite of how little time we’ve had with them thus far. The former is a brainy loner, the latter is anxious and fresh off a break up. Their friendship feels very natural, and you’re rooting for them quickly. Each gets a one-page dossier-like spotlight, which fleshes them out a bit more. 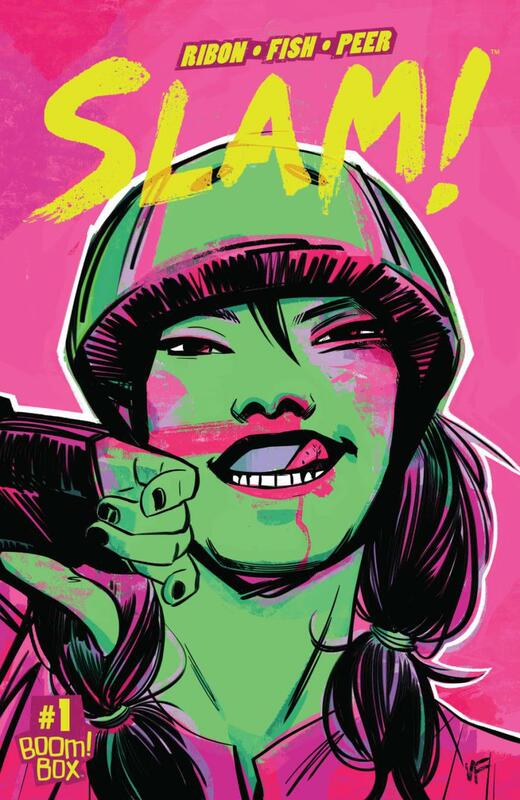 Colorist Brittany Peer gives SLAM! a loud and impactful vibe to compliment Fish’s animated pencils. Like it or not, the neon pink, yellow and green on the cover will reach out and grab you. When you get inside, it’s a lot of deep purples, bright pinks, and blues. There’s a happy energy to it all, even when what we’re seeing isn’t happy (i.e. the last page). It’s very much in the same ball park as one of it’s BOOM! Box peers, Giant Days. 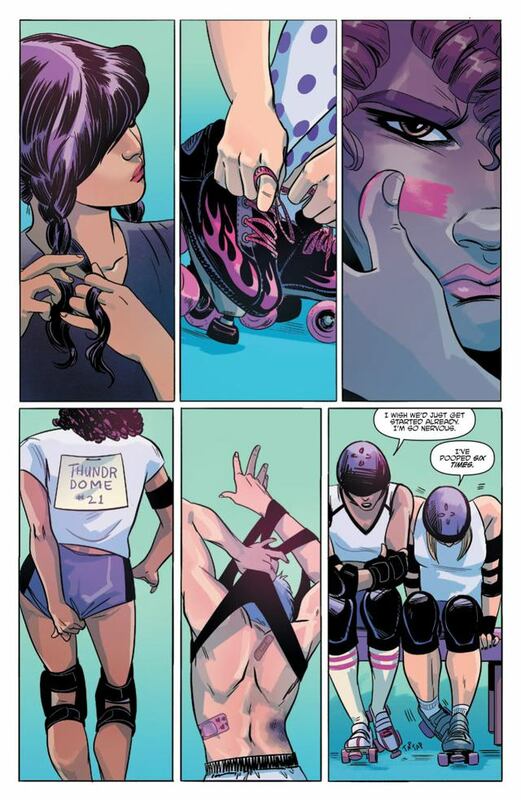 I didn’t expect to be slapping down cash for a roller derby comic. But I’m not sorry I did. SLAM! has me coming back next month. This feels like a comic we should be reading these days. So bring on the bruises! This entry was posted in Comic Books/Graphic Novels and tagged BOOM! Studios, Brittany Peer, comic book reviews, comic books, Pamela Ribon, Rob Siebert, roller derby, single issue reviews, Slam! #1 (2016), Slam! (BOOM! Box), Veronica Fish, women in comics on 11/19/2016 by primaryignition.